Spartanburg Water provides review services and assists with the applicable SCDHEC Delegated Reivew Program permitting process. The resources listed below are provided to assist developers, engineers and contractors with requirements related to sewer main extensions in Spartanburg Water's service area. 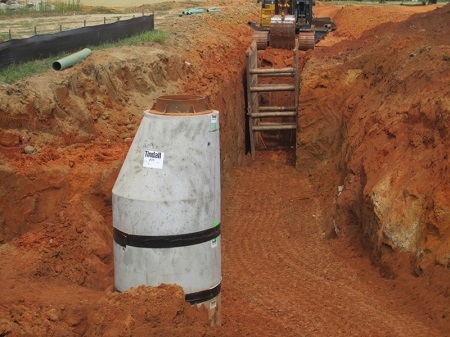 We require all projects to adhere to the standards and requirements outlined in Spartanburg Water's Technical Specifications for Sewer Distribution System Improvements, available in PDF format. Our Developers' Manual is a guide which outlines Spartanburg Water and Spartanburg Sanitary Sewer District's extension policies and requirements related to design, permitting, administration, construction, inspection, release of taps and service connections. The following details are provided to familiarize developers, contractors and engineers with Spartanburg Water typical design details or to assist in the preparation of plans. Any modifications to the details shown should be conveyed to the assigned Spartanburg Water Project Manager. Autocad | PDF Construction Detail No. 5: Manhole Entrance "Boot"